First of all…thanks to all of you for the sweet comments on the home improvements! I can’t believe that we are *this close* to being done. Our plan is to start pulling up lino and carpet Thursday and Friday and then start tackling the hardwoods on Saturday. It’s going to be amazing! The summer is almost over for the boys. Wednesday is the first day of school. They’re ready…but they’re not. We are trying to fit in a few more fun things before it’s back to the old grind. This past Monday we took advantage of some free tickets the boys earned from their summer reading program and took them to Lakeside Amusement Park. 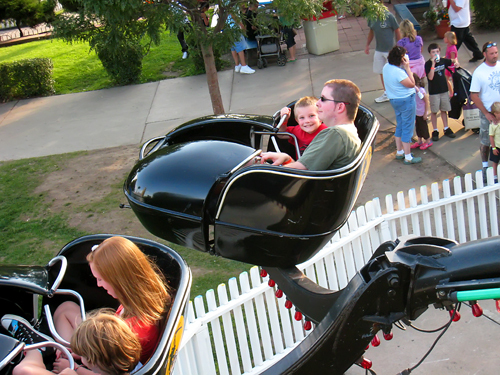 This is the first year that the boys have all been tall enough to ride the “big” rides. 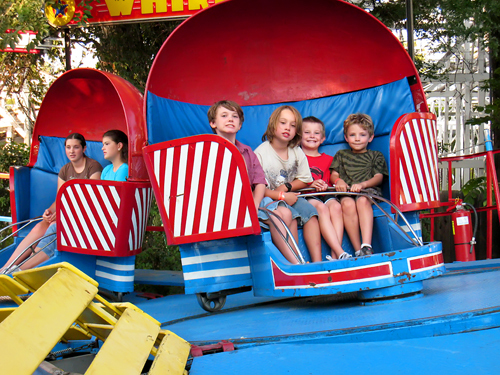 (Except for a few that Benji was still a smidge to short to ride…) Talk about excited! My boys are adrenaline *junkies*! There was not a ride that they did not ride. Wade and I got ride bracelets too. Can’t let the boys have all the fun! The park has all of the old standbys…the spider, the scrambler, the ferris wheel…and a few crazier ones too…the ‘tower’ and the spaceship 2000. 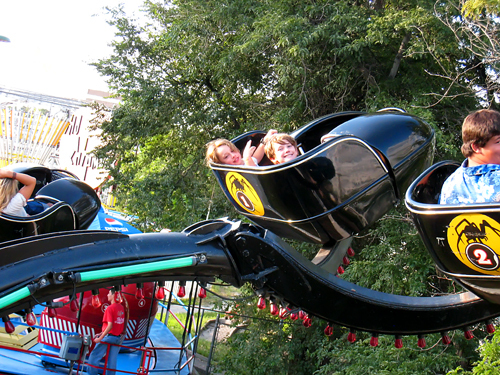 The ‘tower,’ as the boys called it, is one of those strap-you-in-take-you-up-and-drop-you type of rides. The spaceship 2000 has you leaning up against the wall and spinning so fast that you slide up the wall with your feet dangling. You know that one, right? Crazy fun! You want to see pictures??? 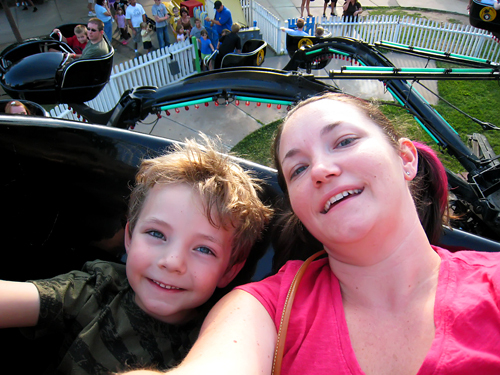 Me and Benji at the top of the spider ride. He giggled like a schoolgirl the entire time we were going! 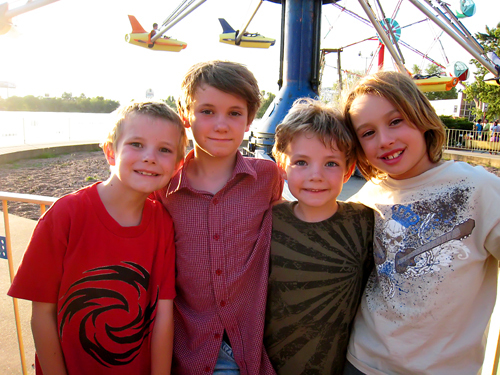 The boys on the tilt-a-whirl…Tyler, Logan, Avery and Benji. How do you spell trouble?? You’re looking at it!! My fave shot (not including the boys). I took this with the ‘little’ camera. 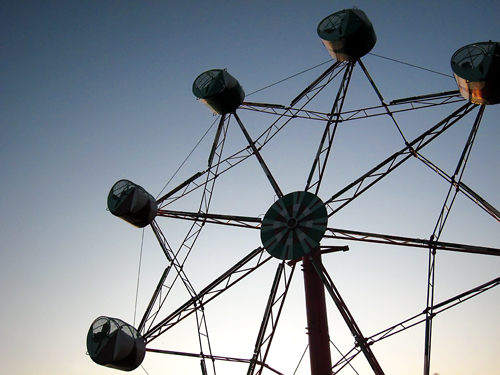 It kind of makes me wish I had taken my ‘big’ camera and shot some artsy amusement park shots. Now this looks like a great way to wind up a summer vacation. Good luck with the flooring project! i like how the one of you and Benji shows wade and avery too. great to get out and enjoy end of summer fun. good for you. cheers to the boys for an awesome school year!